The LOW VOLUME warning means that, when the scanner is set to a test condition where it receives static, the observed audio level is less than 40% of full volume. If the input levels are too low, the audio recordings may have lower quality. Also, the Rangecast software may not be able to reliably detect that the audio port is associated with a particular scanner, rendering the scanner either consistently or intermittently inoperative. 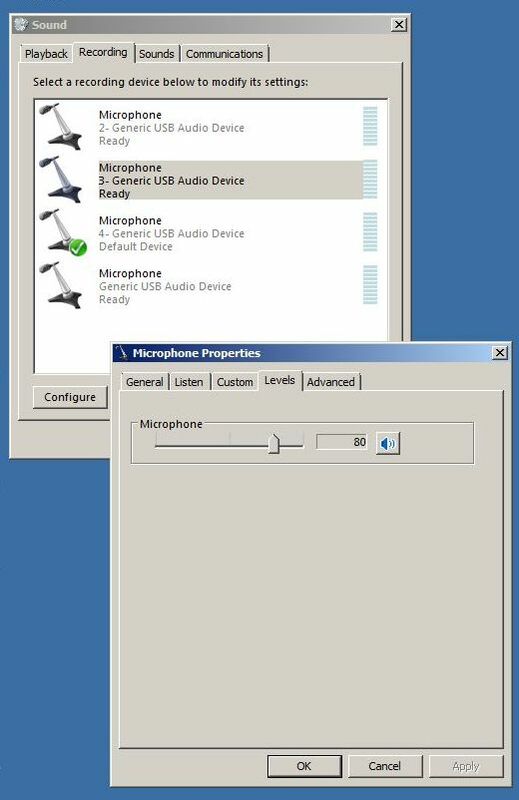 Raise the audio levels in Windows Sound for the audio input from the scanner. In Sound, click on the Recording tab. For each audio input, click on that input, then go to the Levels tab, and adjust the level. On Windows 10 PCs the level must be 100, on Windows 7 a value of 80 is recommended. In addition, for each audio input, if there is a "Custom" tab, select that tab, and see if there is a checked checkbox titled AGC. (This is only present with older hardware.) If the AGC checkbox is checked (as shown), it should be unchecked. 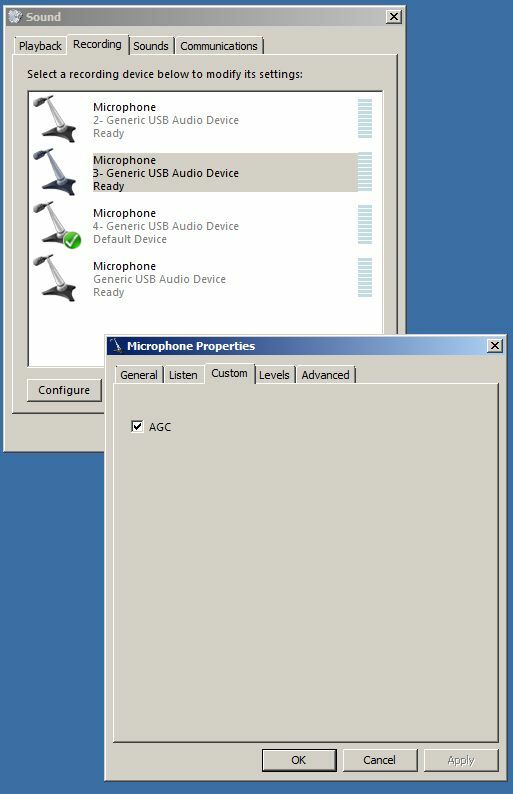 Note that some PCs may show an additional audio input, such as a native sound card (built into the PC), not used for Rangecast. If present, this may show with a red icon and the text "Not plugged in". Audio inputs of this type may be ignored. When finished, restart the Rangecast software. The software measures the radio's maximum volume level at startup, and uses this as a calibration reference for rejecting recordings that appear to be too loud (such as data) or quiet (such as an open mic.) The software must be stopped and relaunched so it calibrates to the new volume level. It is recommended that the audio levels be checked on all scanners connected to this PC. When one scanner shows a "Low Volume" error, it is not uncommon for other scanners to have marginal quality audio levels (low, but not low enough to raise an alarm) that would benefit from adjustment. It is easy to check and correct the audio levels on all scanners connected to a single PC at the same time.